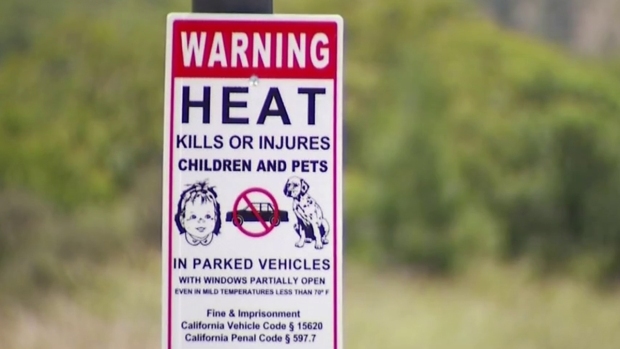 Temperatures in some part of San Diego County will creep into the triple digits as a bout of hot weather brings increased fire danger to Southern California. The National Weather Service (NWS) has issued a Red Flag Warning for San Diego County's mountains and deserts. The warning will be in place 2 p.m. Monday to 9 p.m. Friday. The weather service says a combination of very high temperatures, low humidity and tinder-dry brush will elevate fire danger in the mountains, foothills and other areas. Monday, strong, gusty winds will blow southwest to west at 15 to 25 miles per hour, with gusts reaching 35 miles an hour. Critical fire weather conditions possible as a hot, dry air mass moves into much of Southern California. NBC 7's Elena Gomez reports. Heading into Tuesday, winds will pick up, with local gusts of up to 40 miles per hour. Stronger southwest to west winds of 25 to 30 miles per hour will remain until Wednesday. Soaring temperatures are expected through Wednesday as a high-pressure system rolls in, according to the NWS. Southern California already has dealt with a number of wildfires that have burned homes and killed at least one person.